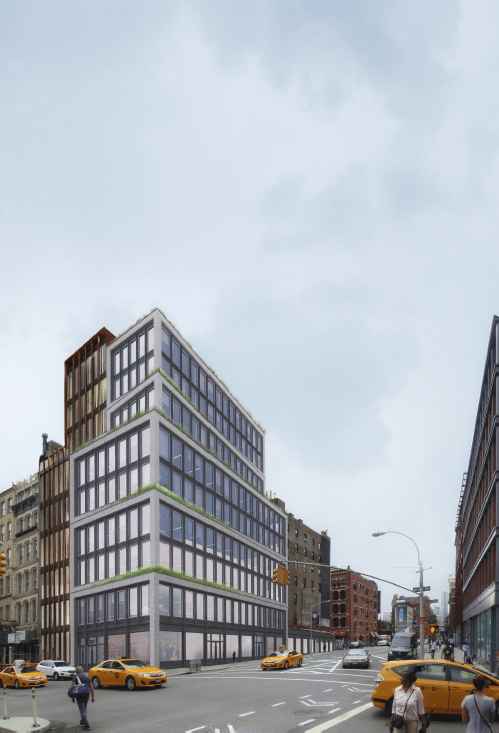 363 Lafayette Street Rendering. Image Credit: LPC. Commissioners asked for further refinement to asymmetrical development composed of stacked rectangular forms. On July 12, 2016, the Landmarks Preservation Commission considered an application to develop a vacant lot at 363 Lafayette Street in the NoHo Historic District Extension. The lot extends the width of the block, also fronting Bond and Great Jones Streets. The northern portion of the lot is much wider than the southern section. The proposed new building would be used for commercial purposes with a showroom on the ground floor. The building would adjoin a co-op at 20 Bond Street at the southern portion, and a taller building now under construction at 25 Great Jones Street. Elise Quasebarth, of Higgins Quasebarth Consultants, testified that the lot’s odd shape was due to the cutting through of existing blocks by the construction of Lafayette Street in the late 1990s, which also created corner sites out of mid-block lots, with sidewall facades facing the street. Quasebarth further stated that the east side of the section of Lafayette Street, on which the lot in question is sited, did not possess a great deal of significant architecture, but the district displayed a fair amount of interesting contemporary architecture antedating the extension’s 2008 designation. Architect Morris Adjmi presented the plan for the new building. The bulk of the massing would be situated to the north of the site, with a one-story portion extending south to Bond Street. The taller portion of the building would be composed of a series of three two-story, masonry-framed rectangular forms, increasingly set back from the street facades as the building rose in height, creating the impression of stacked blocks. Planting beds would be installed on the terraces created by the setbacks, and decorative terra cotta bands would separate the floors. Terra cotta fins would also add depth to the facade. For materials, the building would clad in brick with terra cotta ornamentation and metal-framed windows. The design was inspired by the cast-iron facades, framed with masonry envelopes of the district’s historic architecture. At the corner of Great Jones and Lafayette Street, the building would rise to ten stories with a total height 140 feet, excluding bulkheads. Adjmi stated that the design team had worked closely with the co-op at 20 Bond Street to ensure that the development did not impinge excessively on the residents’ light and air. The Greenwich Village Society for Historic Preservation’s Andrew Berman criticized the proposal’s massing and testified that the “unrelieved repetitiveness of the façade, particularly along Lafayette Street, makes it too horizontal in its expression and vastly out-of-keeping with the existing historic structure.” Speaking for the Historic Districts Council, Barbara Zay said the site calls for a “highly finessed solution,” and that the proposal required further refinement. The Society for the Architecture of the City’s Christabel Gough testified that the proposal resembled a “zoning diagram,” and said it appeared to “lean drunkenly” on the adjoining building at 25 Great Jones Street. Landmarks Chair Meenakshi Srinivasan stated that Manhattan Community Board 2 had issued a recommendation for approval of the application, with modification. Recommended modifications included increasing the proportion of solid to void, narrowing the windows, and creating a green roof on the southern portion of the building adjoin 20 Bond Street. Chair Srinivasan said that she supported the applicants approach to the site, noting that it was an idiosyncratic lot that allowed a variety of responses, to which the design spoke specifically, in a unique district that already possesses a great deal of contemporary architecture. Commissioner Michael Goldblum determined the proposal to be appropriate for the site, which he found to be an area where a designer could “play fairly loosely,” and that the proposal was not discordant with neighborhood. Commissioner Wellington Chen agreed, saying the proposal was of a part of the district’s natural vernacular of contemporary buildings. Commissioner Fred Bland expressed admiration for the design, but said he was conflicted about the massing. Commissioner Adi Shamir-Baron found the apportioning of the massing to lack a rationale, and said the proposed structure failed to read as a corner building. Commissioner Michael Devonshire stated that he would like to see some alternative designs presented by the applicants before reaching a determination. Without enough consensus to call for a vote, Chair Srinivasan asked the applicants to reexamine the massing and articulation, and to explore the design a little more, before returning to landmarks with a revised proposal at a later date. LPC: 363 Lafayette Street, Manhattan (18-6969) (July 12, 2016) (Architects: Morris Adjmi Architects).